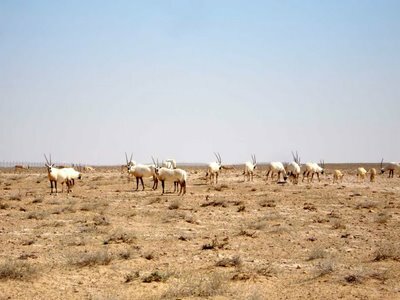 The Arabian Oryx (al-Maha) were brought from Saudi Arabia in an effort to increase their numbers in the Syrian desert. al-Maha are known by their beautiful eyes, that in some old Arabic poems the beauty of women’s eyes were compared to theirs. Great picture as always Ghalia. However, the Maha is not a wild cow, it's an antelope species of the the genus Oryx. There are 4 subspecies, 3 of which come from Africa and the fourth resides in Arabia. 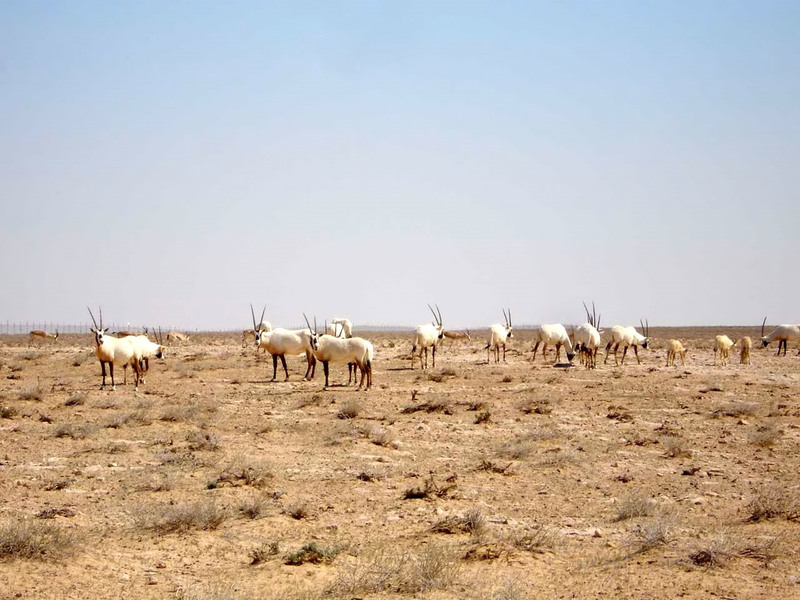 This last one is what we have in Syria (The Arabian Oryx). I really wished to take a closer shot, but they were running away every time I step closer! Abu Fares, I asked the man working there about them, he was kinda of something engineer and he assured to me that they were cows and not antelope, I even checked it in an Arabic/Arabic dictionary and it meant wild cows. The Oryx is considered from bovine family I guess! However, remember that verse from the 8th grade? It was about cows in shar7 el mufradat! Karin & Yazan, thank you for your lovely comments. Amr, It was near Palmyra, in ma7mieh tabe3ieh that's why they were fecned, but when they grow up they set them free! ghalia...still we need a closer pic to see the eyes....hope y get this one soon. a very good step to enrich the syrian fauna. i hope the hunters respect the rule. May is our Hero as well, all liberal Syrians are happy that she is back and hopefully louder than before. Welcome back!!! We need more Maha's speaking up and modernizing the country! sorry kind of long, read 3rd section if you want quick. only people with hearts and brains can read, no need for hyprocrites. I got the close up for you! today the SVN (syrian volunteer network) which is working in association with the syrian red crescent and various syrian ministries to help accommodate families and refugees coming from lebanon started it's activities. we are trying to accommodate as many people as we can in the limited time and recourses we have...please if anybody is interested in volunteering, we can use all the help we can get..
Ghalia - where are you?? Good to know what my name means! some dictionaries say the eyes of a wild cow and others a kind of deer!